Nanostray 2 is ready to take shoot em up action to a whole new level on the Nintendo DS, but will it better the mediocre efforts of the first title? It's time to save the universe once again. This time around, Nanostray 2 actually has some kind of story behind all the blasting. A deadly virus has taken over the universe, turning once peaceful species into violent bloodthirsty enemies. As captain of the galaxies most advanced fighter, it is your job to research this virus by collecting samples and eventually locating patient zero, the first person infected with the virus, in order to synthesize a cure. Rather than set up some kind of intergalactic medical screening program, you're sent off to blast your way through hordes of aliens in order to acquire the data you need. Once again, game play is spread over 8 stages which represent 8 different planets. This time however, some stages scroll horizontally while others scroll vertically. Your fighter is still armed with some pretty impressive weaponry and we are delighted to tell you that the fiddly touch-screen activated weapons are gone. Instead, you get a basic forward shot for a primary weapon, which can be augmented by collecting satellites that will fly next to you and fire the same primary weapon. Before a stage starts you are given the chance to tinker with the satellite alignment. You can make the satellites fire forwards, backwards or above and below your ship and change the alignment however you please. You can set three pre-set configurations and change between them during game play using the shoulder buttons. So, for example, if you'd set one of the pre-sets to point the satellites to the back of your ship, should you require some backward firing fire-power, you can quickly select this satellite configuration with a tap or two of the shoulder buttons. 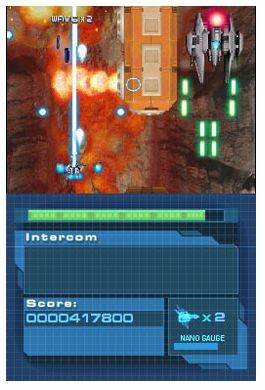 Of course, you never know what to expect on a stage, so you may end up having to replay a stage with a different configuration for maximum score, but shoot em up fans usually relish the opportunity to replay stages to perfect their techniques. As well as the primary weapon, in Nanostray 2 your ship can carry one of six different secondary weapons. Only two are available at the start of story mode, the rest are unlocked as you progress. The secondary weapons are much more destructive than the primary shot, but can only be fired a limited number of times before their energy is depleted. Destroying waves and collecting blue coins will recharge them however. As with the primary weapons, choosing the best weapon for the stage will take some practise and experimentation. Nanostray 2 is considerably more challenging than its predecessor and the new weapons aren't the only change to your fighter this time around. The screen clearing, boss-mangling smart bombs are gone (we're guessing you used them all up in the first game). Furthermore, your fighter can only take a single hit from enemy flack before you lose a life. If this sounds harsh, you probably don't play many shoot em up games! Story mode only gives you a limited number of continues and lives before you are forced to start from the beginning again. Many will see this as an improvement on the original, which could easily be completed in an afternoon.